These clips are used anywhere along the cable run where additional fastening to the floor surface is required. They aid in keeping the cable flat to the floor surface prior to applying self-leveler or thinset mortar. These clips are particularly useful to anchor the cable when the use of metal strapping is not practical or necessary. Examples would be a cable running parallel to the metal strapping, or in tight spaces where only single anchoring points are required. 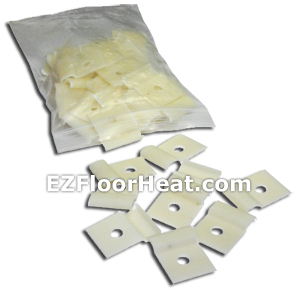 Included with all Cable & Mat Kits, these clips are offered below in bags of 50 for those installations requiring more clips then the amount provided with each Cable or Mat kit (very rare), or to replace clips damaged during removal when an unexpected change in a layout design arose.